There are some pieces of equipment that immediately leap to the forefront of the audio world. The new TechDAS Air Force Zero turntable is such a piece. It stands at the very pinnacle of audio reproduction, redefining what’s possible to extract from the grooves of an LP. 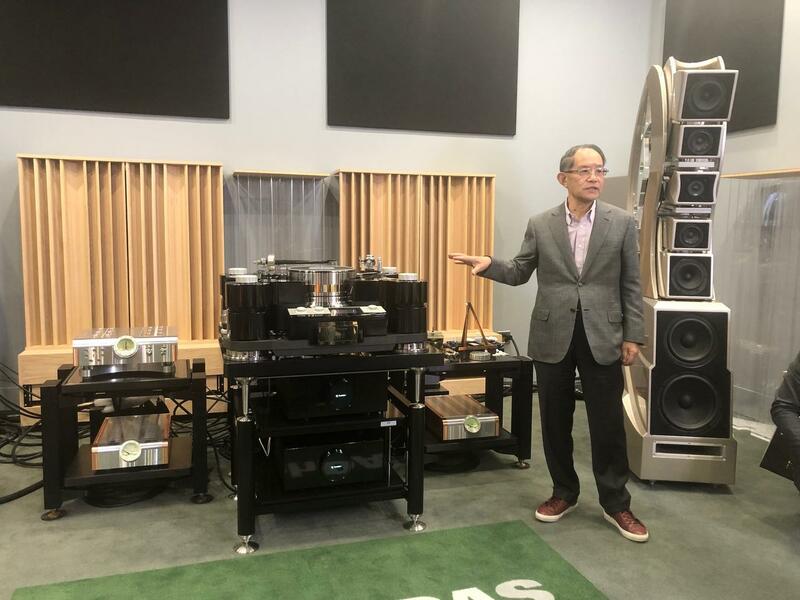 Last night the fabled engineer Hideaki Nishikawa (pictured below) and several of his associates unveiled his latest TechDAS creation at the Audio Salon in Santa Monica, where about forty music lovers gathered to listen to it. Mr. Nishikawa conducted a kind of master class in turntable technology, explaining many facets of the Zero. His massive new ’table weighs in at a not-insubstantial 771 pounds, in large part a result of the multiple platters he uses, including the top one composed of tungsten; others are made of a variety of proprietary substances. All are floating in an air bearing. I’ll be the first to admit that I approached the ’table with some skepticism. I expected excellent performance but nothing revolutionary. For one thing, I have not heard a turntable that was substantially superior to the Continuum Audio Labs Caliburn I’ve used for about a decade. Oops—the Zero creamed it. I also was underwhelmed by the photos that I had seen of the turntable. In “person,” however, it looked both impressive and attractive. Maier Shadi, the proprietor of the Audio Salon, has just completed a larger new room to house big systems such as this one, which featured Dan D’Agostino Master Systems electronics (Momentum M400 monoblock ampfliers and an HD preamplifier) coupled to the Wilson Audio WAMM Master Chronosonic loudspeakers and subwoofers. You could derive a real sense of the sonic prowess the equipment was capable of delivering in this spacious and inviting room. The sound—oh,the sound—that the Zero produced in this setup was truly captivating. The noise floor depths were subterranean and the octave-to-octave balance seamless. 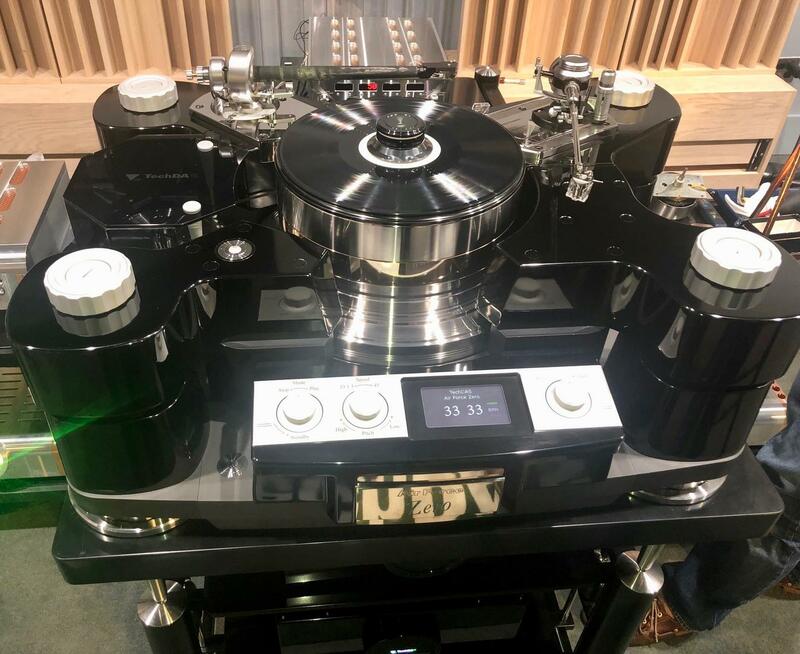 It was immediately apparent to me that the TechDAS Zero—here outfitted with the latest SAT (Swedish Analog Technologies) CF1-12 tonearm and Lyra Atlas SL cartrridge—was delivering a fundamentally different approach to vinyl playback. Never have I heard such 3-D presentation of musical notes. Never have I heard voices conveyed through a loudspeaker so convincingly—not only were they accurate in dynamic detail but also in their placement within the soundstage. Listening to a passage from Tosca I almost believed I was sitting ten feet away from the tenor, so realistic were the system’s sense of fidelity and lack of dynamic constraint. Chimes rang out with supreme delicacy and endlessly lingering decays. Another notable moment came when Mr. Nishikawa played a Louis Armstrong LP. The pitch definition was so exact that it was something of a revelation for me to listen to Armstrong’s trumpet solo: There was a density to the burnished sound that I had not previously experienced. Shadi had asked Michael Fremer to spin a few discs, and on some of his rock music selections you got a real sense of the TechDAS Zero’s relaxed yet crushing authority. But for me perhaps the highlight was a Deutsche Grammophon recording of Gidon Kremer and Martha Argerich playing Beethoven’s Sonata No. 1 for piano and violin. The silky smoothness of the TechDAS playback allied to a seemingly limitless palette of dynamic gradations…it sounded simply gobsmacking. An audio component as technologically complex as this one (not to mention priced in the stratosphere) should smash the sonic sound barrier. That doesn’t always happen,but this time it has. 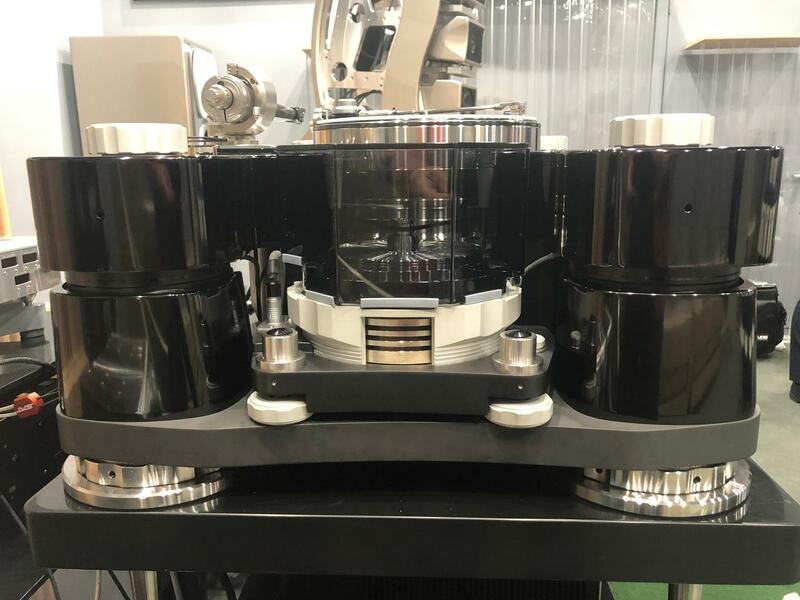 I salute TechDAS for its accomplishment that will inevitably help to foster better turntable performance at every level. And by the way, later that evening Mr. Nishikawa explained that the ’table we heard was merely a late-stage prototype. When the Air Force Zero goes into production in September, he expects further improvements. A frightening thought. Exciting too.